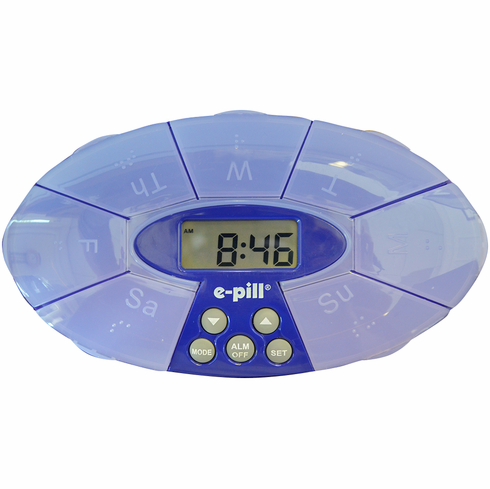 Pill organizer and pill holder with alarms. Large capacity weekly pillbox with ONE Compartment per Day. Up to 4 daily alarms. Easy to handle, easy to hear and easy to open compartments. Set the alarms once and they auto repeat every day (no reset required). Never forget to take your medications again. Feel better. Avoid medication errors by organizing all your medicine once a week. FREE Standard Shipping. 30 Day money back guarantee. FREE Batteries. Easy hassle-free returns. (click any image to enlarge) | Most Popular<?a> Pillbox with Alarms. No Monthly Fees. FREE Standard Shipping. Pill Capacity: 45 Aspirin sized tablets in each daily compartment.